This was the final game of the season and the final Flippa Ball game for Year 6 students Amelie, Charlotte, Jahn, Bridie and Liam. As expected it was a hard fought game with the scores to'ing and fro'ing between us and the opposition. In the end the final score was a 3-3 draw. Player of the Day went to Liam for his usual wall-like defence; the whole team also got Player of the Day. The Years 5/6 team had a great season and improved significantly in Term 3 where both defenders and strikers developed a better understanding of the game and started to play with speed and power. Well done to the whole team for an excellent season. Your coach thanks you very much. The Marlins had their final game of the year on Sunday evening. It was a great game to watch and an even better end to the year. Everyone worked really hard on swimming with the ball and passing in front of the other team members when they were available. The strikers worked really well as a group, passing amongst each other to open up opportunities to score. The defenders worked hard to stick to their players and stop the ball from getting to the net. Our goalies did well blocking almost every ball that snuck past the defenders and to then throw the ball up the pool to the strikers was a win 12-1. Player of the Day went to the whole team for playing extremely well for the season. Well done everyone for such a fantastic two terms of Flippa Ball where the team remained undefeated. The Wentworth Comets have enjoyed another win in Basketball with a score of 16-7. Players of the Day were Alexander Kawan and Ben Oliver. The team is now on a six win streak and on course to the finals. The Wentworth Marlins had another great game on Sunday evening. Quite a few of the players played their best game so far. We mixed up the positions at half time putting the strikers in defence and the defenders up in strike and all the players played really well in the new positions. The players were swimming with the ball and sticking to the right positions all through the game. It was another win 8-4 and Player of the Day went to Kahn Heath for his great defensive work by never giving up and fighting for every ball that came his way. The Wentworth Stars shone brightly on Thursday night in their final game of the season. The Smurfs (aka Whangaparaoa Primary) team were a formidable force and they certainly made our Stars work hard on defence. Unfortunately it was not a fairytale ending to the season for the Stars as they did not come away with the win, however the smiles on their faces proved that they had themselves a 'smurfing' good time! A HUGE thank you to Mrs White, Mrs Clark and the four College Student Coaches - Amelia Paxton, Summer Wihone, Lauren Ovenden and Arwen Hulsbosch - for their time and dedication to this team. We all appreciate your effort and support and quite honestly, we couldn't do it without you! 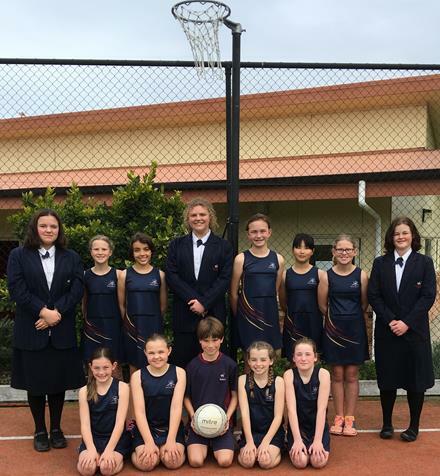 To those Year 6 students who will play netball in another team next year, we wish you every success and hope to see all of our Year 5's back for another fabulous netball season in 2018!